Is there a Loch Ness Monster? Does anything swim in the dark depths of that Scottish lake? The proofs offered range from controversial photographs and films to close up sightings by various people of varying observational skills. However, the gold standard that will finally convince the majority is a piece of the monster itself. Once you deliver that pound of flesh to the laboratory of science, it is no longer a case of "if" but "what". To be fair to scientists, that has been pretty much the stance of zoologists since this mystery came to the public's attention 80 years ago. Admittedly though, some have departed from this strict methodology. Dr. Maurice Burton, who worked at the Natural History Museum, was one of the early advocates of some large creature in Loch Ness. As we know, he eventually retracted such views. There was also Dr. George Zug, curator of Reptiles and Amphibians at the renowned Smithsonian Institute in Washington. Having examined the 1975 underwater photographs of the Academy of Applied Sciences, he said: "I believe these data indicate the presence of large animals in Loch Ness, but are insufficient to identify them." But, in general, zoological scientists demand a live specimen or a verifiable sample of a dead animal. From these, morphological and genetic analysis leads to the creature being classified and taking its place in the "official" tree of life. Clearly, the Loch Ness Monster still swims outside of that system, despite premature names such as Nessiteras Rhomboteryx. Visit a few cryptozoological forums and it won't take long to find skeptics deriding any talk of large, unknown creatures in lakes, forests or mountains which do not provide the body. The Loch Ness Monster is no different and the question has to be asked, why has no physical evidence for this creature turned up after eighty years of searching? The critics say it is because there is no Loch Ness Monster. This blog takes a different answer to that question. But for part one of this subject, I look back at some claimed carcass finds in decades past. 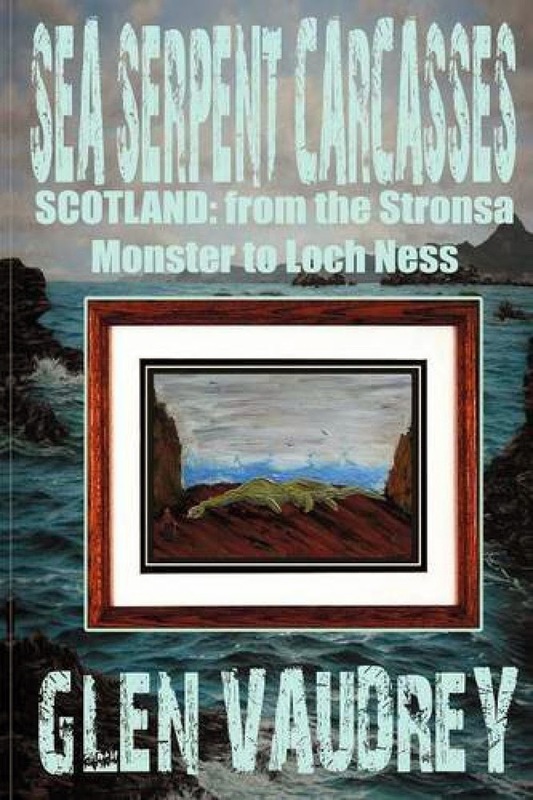 To this end, I recommend Glen Vaudrey's "Sea Serpent Carcasses: Scotland: from the Stronsa Monster to Loch Ness". Glen's focus is on the various bodies that have washed ashore on Scotland's coasts over centuries past such as the Stronsay Monster of 1808 and the strange Gourock beast of 1942. Most of these have or will turn out to be the ubiquitous Basking Shark carcass, others may live on in mystery. Firstly, in terms of folklore, we have a few tales of Kelpies being killed or captured. Those captured were press ganged into forced labour and one tale of a dead one describes it as assuming a jelly like form by the morning. None of these tales centre on Loch Ness. But carcass stories from around Loch Ness take up about a tenth of the book and range from whole bodies to bits and pieces. The oldest one is surprisingly from 1868 when a strange looking body was found washed up at the top end of the loch. 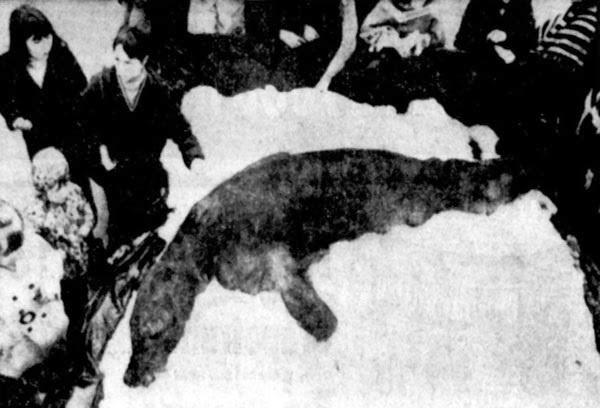 I covered this one in a previous article and it may surprise people that such a stunt was pulled 65 years before the Nessie story began in 1933. But monster tales have been around longer than that and evidently some waggish boat crew took advantage of this. So a monster hoax presumes a monster tradition, and that carried on through to 1933 when Marmaduke Wetherell found his fabricated tracks on the loch side. This is not strictly carcass material, but residual traces of monsters such as tracks or faeces could, in theory, provide DNA material. I mused on this subject in this article. The most well known Nessie "carcass" is the one which was supposedly found at Loch Ness on April 1st 1972 and was apprehended by the police by the Forth Road Bridge as its owners headed south. An examination proved it to be nothing more than a dead elephant bull seal with some cosmetic alterations. The date also gave away the motives of the perpetrators. There are other stories you can consult in the book such as the dead conger eels found in 2001, the plesiosaur fossil vertebrae of 2003 and the alleged tooth of 2005. But there are two stories not mentioned in Dale's book which I cover here. The first is the alleged carcass spotted by Robert Rines' team in 2001 as they sent a ROV down into the mouth of Urquhart Bay (below). It was found at a depth of about 330 feet. Now it has been speculated that it has a morphological resemblance to the Loch Ness Monster and that is conceded. I myself think it is nothing more than tree debris. A lot of logs and branches make their way down from the rivers Enrick and Coiltie into the bay. Moreover, the size of the object is not stated and as far as I know, no attempt has been made to recover it. The second concerns the object in the postcard below. 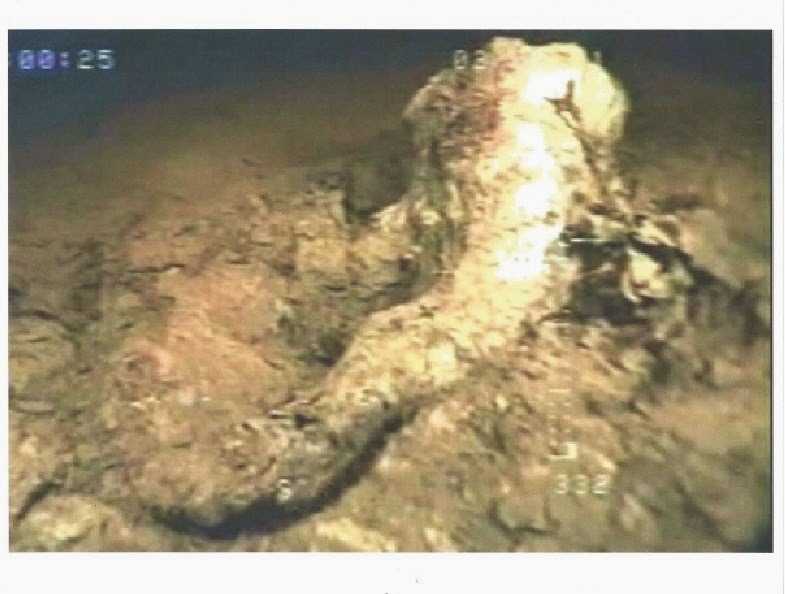 Now the story of this foot was certainly doing the rounds in the late 1950s and into the 1960s and was presented as proof of the Loch Ness Monster. Tim Dinsdale recounts looking at it during his second expedition to the loch in July 1960. You can read his fuller account in his book "Loch Ness Monster". However, he found it at a house in Drumnadrochit and the owner allowed him to examine it. The foot was well preserved and measured thirteen by seven inches. It was apparently found by Urquhart Castle, but Tim was in little doubt it was the foot of an alligator or crocodile. He speculated it may have been from the Gharial species, of which we have a picture below to compare feet. Also note the long snout which Tim speculated could be mistaken for a long necked monster! But Tim (like myself) speculated this may actually have been a genuine carcass find at Loch Ness. Dinsdale refers to the story related by Rupert T. Gould in his 1934 book, "The Loch Ness Monster and Others" (page 140). Gould tells of a story from a Mrs. J. S. Fraser who was told to watch out for the crocodile by the shore of Dores in 1888. This was apparently due to a South African who had settled in a house between Dores and Foyers and had brought three young crocodiles. When they became too big to look after, he arranged for them to go to a zoo, only for one to escape into the loch. A different slant on this story is given in a letter by David Murray Rose to The Scotsman newspaper of 30th November 1934. He tells of how three young crocodiles were presented to the Scientific Institute at Inverness by a John Fraser of Charlestown, Carolina in 1827. Two of them died and the other was placed in Loch Ness at some unspecified time. Rose speculates whether the longevity of crocodiles saw this one survive to that present day. In fact, one crocodile was definitely seen in Loch Ness in 1938 as this article from the Scotsman shows! Gould also makes mention of a crocodile like skull that was found in the waters of the River Shiel in Loch Moidart some years before 1933. This is a long way from Loch Ness but interestingly feeds into that other Water Horse body of water - Loch Shiel. Perhaps one loch monster has a carcass to speak of? Such is the story, but one must wonder how long a crocodile would survive in Loch Ness? The aforementioned foot seems to have been found in 1937 in the waters of Urquhart Bay, according to an article I found from the Aberdeen Press and Journal of May 8th 1958 (below). Could this have been the foot of this escaped crocodile? Perhaps, perhaps not. I leave it to the reader to form their own opinion. It may yet turn out to be nothing more than a trophy foot brought in from a foreign trader. In conclusion, Loch Ness has its fair share of carcass stories, but all are hoaxes with the possible exception of our crocodile foot. I am not suggesting Nessie is a crocodile, but two independent sources suggest a crocodile may have once inhabited Loch Ness for some period of time. One wonders where this foot is now? It makes for a great story and a nice exhibit for one of the exhibition centres at Loch Ness! Part two of this article gets down to the nitty gritty question. Why has no Loch Ness Monster carcass been found? There are three possible answers to this, I concentrate on one of them next time.